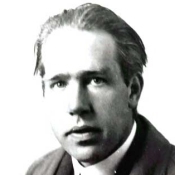 The Danish physicist, Neils Bohr, is quoted as saying: `if quantum mechanics hasn't profoundly shocked you, you haven't understood it yet". Yet here was a man who won the Nobel Prize for physics for his research on atomic structure and radiation. To give us a small insight to the topsy-turvy world of the quantum we invited Prof Andy Schofield from Birmingham University to explain how things at the atomic scale are so different from our experiences of everyday life. One of the central ideas to take on board when you enter the realm of the atom is that suddenly everything is about probabilities. The standard classroom model of the atom, whereby a central nucleus consisting of protons and neutrons is circled by small particles called electrons, is in fact not quite the whole truth. The French physicist Louis de Broglie theorised that all matter can not only be thought of as particles but also as waves. Each particle or collection of particles has a corresponding wavelength that is inversely proportional to its momentum. So that an everyday object such as a football, with its relatively large momentum, has an incredibly small wavelength associated with it that is too small to be measured. Conversely, small particles like electrons have relatively small values for momentum and so they can appear to be waves rather than particles. Hence the classical model of the atom can be replaced by a central area of fuzzy wave-particle objects that represent the nucleus surrounded by a blurred halo of smeared out waves that are electrons. This model makes it very difficult to actually pin down the particles in a region of space and time, which is where probabilities come in. The German physicist, Werner Heisenberg, realised that you could not know both the position and momentum of the electrons as they orbited the nucleus. This quantum effect is known as Heisenberg´s Uncertainty Principle and it helped him to gain a Nobel Prize in 1932. Although Albert Einstein had himself gained a Nobel Prize for his work on the photoelectric effect - a quantum phenomena - he was deeply troubled by the introduction of probability into the field of physics. In one of his many debates with Neils Bohr he said, "God does not play dice" to which Bohr replied "Einstein, stop telling God what to do!" It may appear that quantum theory is a very esoteric field that has no practical applications but computer researchers are very motivated to try and put it to use. Whereas most computers use a memory store made up of `bits´ that store either a one or a zero, a quantum computer holds a series of "qubits" which can store zero, one or both at the same time. Not only can the qubits take on this superposition of states but they can be "entangled" to become a "qubit register" so that a quantum computer can perform very complex calculations.